Valhalla's second magical company's vice captain, Mimulus Wallenstein has come to the command post with a sorrowful expression. Although she said that aid will come to relieve the soldiers, it was all lies. Although they were given Einherjars by the regimental headquarters, they were all defeated by enemy's EXE members in the first sortie. They haven't been able to contact the inside world yet, Mimulus' squadron status was that of being completely isolated in the subway. The chain of command in the regiment headquarters was also out of shape and there were signs that hinted defeat in this battle. While spitting a sigh, Mimulus opened the company commander room's door. After she opened the door, she found the man who led the company sitting in the back under the lamp's light. Probably writing a letter, he wrote something with old-fashioned brush and ink. "Mimulus, how was the situation?" The man who could be called "old", asked her. "...you know even without asking don't you. The soldiers' exhaustion has long surpassed the limit. It would be correct to say it's hopeless." As she spoke while sighing, the old man stroked his trimmed beard and continued to write a letter. "In other words, they're useless as a military force?" "Yes. We need to retreat as soon as possible, give them treatment and allow to rest. They continued to suppress the several thousand Inquisition's soldiers enclosing on us, we should show them appreciation accordingly. Is the communication with Eliza-sama still disrupted? Unless we get a supply of goods, we cannot..."
"The situation has changed. There is a conflict on the inside, it seems like Eliza-sama has died." Even while hearing of Elizabeth's death, Mimulus was unfazed. If anything, she made a relieved expression. "Don't expect any aid from the Chairman that's appointed on her place." "...then, what shall we do?" "We need to activate the barrier earlier than planned. We need to destroy as many enemies as possible within the range, and build our territory on the outside. In order to prepare for the next coming, we need to defend the Grey City." Mimulus narrowed her eyes and placed her hand on her mouth, thinking. The original plan was to conquer the Border called Grey City, thwart the enemy invasion and stretch out a super-strong protection barrier as strong as the one used in the shelters, constructing a witch territory in the outside world for the invasion purposes. The resistance of Inquisition was beyond their expectations, and they were fast to take their positions too. While the Pureblood Party was preparing the operative procedure for the barrier's completion, their fortifications were almost overtaken. "The scout troop has reported the enemy's next target to be our company. Before long the enemy will collapse and bury it... and the higher-ups have decided its abandonment." "The subway? Can't we move our troops...? We don't have enough personnel to carry everyone." "No... I'm saying that the bunch above decided to abandon the company itself." When she understood the meaning of old man's words, Mimulus unconsciously yelled. "They want to abandon all of them?!" "Leave it. While the enemy's forces are concentrated in here, all Einherjars as well as Mechanical Dragon will be activated and will raze enemy's camp." "You want us to use subordinates as decoys...! Leave them, and get away to the headquarters just the two of us?! I won't acknowledge such decision!" "It's the consensus of West Side. You can't defy it." "!! Then you can just run away alone...! I will remain in the camp! I'd rather fight together with my comrades and die...!" With a rough tone of voice Mimulus flared up at the old man. He slowly turned on his chair and put the reading glasses on the desk. He had deep wrinkles under his eyes which looked like a tired crystal. From the condition of his earthen-colored skin on his cheek, one could see at a glance that he was suffering from a disease. The old man stared at Mimulus sadly. Like a father taking pity on his child. "Instructed by the higher-ups I have been entrusted with you for many long years.. a time like this will come eventually, I thought so with a chagrin." Leaning deeply on the backrest, the old man looked up at the ceiling. Unable to understand the meaning of what he suddenly said, Mimulus frowned. "It's about the current you. You have grown up without being distorted, turning noble... as a righteous pureblood I have raised you to grow beautiful..."
Able to understand less and less, she suspected him of having some different motives. The relationship between the old man and Mimulus was long. He picked up Mimulus as an orphan and raised her to become a full-fledged witch. There was never any conflict between him and her despite the fact she wasn't all that committed to purebloods, he wasn't a man who would give vile instructions. "Thanks to you I have become this kind of person...! I grew up watching your back! That's why, please... don't betray my ideal!" As Mimulus desperately tried to persuade him, the old man was unable to bear it any longer and covered his face. "Despise me. Despise the bunch from Insect Cage who destroyed your heart and turned you into a monster, as well as the West Side who only thought of using you... and me, who didn't defy their orders and obeyed them..."
"What happened commander...! What are you saying for a while now?!" "In the end, everything I have done was for naught... I tried to make you forget and let you live a life of a normal human and acted like a hypocrite..."
The old man slowly opened the desk's drawer and took out a handgun from inside. He put the muzzle to his own temple. "A sorcerer of my degree is unable to restrain you any longer." Understanding that he was trying to commit suicide, Mimulus shook her head and stretched her hand out in the air. "No way... please stop... why is it? Is it my fault? Then please tell me the reason! What will happen to us if we lose you?! What should I do?!" "The higher ups want to release you. They have released you several times during this war, but I cannot bear to look at a girl like that. Forgive your weak father, Mimulus... this is the last time you will be used." His finger strongly pulled the trigger. Mimulus immediately ran up to the old man. The old man's trembling lips spun words. Hearing the words of power right before the bullet was fired, Mimulus' feet stopped. The old man's head was blown away along with the gunshot, and he soundly fell off the chair. Blood splashed onto Mimulus' cheek. Her facial expressions were frozen, and she didn't wipe the blood either. With eyes wide open she watched the old man's corpse. The bullet penetrated the head, and from the sight of brain and blood dirtying the floor she understood that the parent who brought her up has died. But what Mimulus understood wasn't just that her father has died, but also that her shackles were off. Inside of her head, memories and experiences revived like a muddy stream. She recalled who was she. She recalled what was she. Clear drops ran down her cheeks and eventually mingled with the old man's blood staining the ground. She recalled everything. The fact that the current her was a lie. That the corpse in front of her was not that of her father. And the fact that the human being called Mimulus didn't exist right from the beginning. "Ahh... that's... right. I am..."
——Laugh Maker made a violent smile. Kurogane Hayato stood on top of a roof's building while looking at the landscape which turned into ruins. Aside from Hayato in his Witch Hunter form there was another EXE member. His Relic Eaters were "Caligula" and "Maximilien". In the history of EXE, there was no precedent for anyone to be chosen by two Relic Eaters. Jet black and silvery armor, sinister and sublime have combined symbolizing their respective magic properties of "Tyrant" and "Revolution". Hayato released the Witch Hunt form and while performing a gunspin, he holstered the guns at his waist. "...no matter how many times I look at it, this mass of destruction takes me aback, captain Kurogane." Even as he heard voice from behind, Hayato did not look back. Only indifferently responded to the voice. "Oonogi, I should have given you an order to return at once. Thanks to you I wasted time for no reason." "You use people strictly and now this huh. I have properly passed the message to Ouka-san." While pouting, Kanata lined up next to Hayato. Below them there was wreckage of an Einherjar and the corpse of an Ancient Wizard, it was clear that the destruction wasn't worth the number defeated. The street of the Grey City that were on the verge of decay have changed drastically. "Can I be frank and ask something? Just what is Ootori Ouka to you?" "What will you do if you know." "It's just my curiosity, after all I'm also part of the organization. Even if she's just adopted, she bears the name of Ootori and cannot be trusted. She might be detrimental to our dissent." After saying 'dissent', Kanata waited for Hayato's reaction. While looking at the ruins below him, Hayato quietly spoke. "I know nothing of the dissent you're speaking about." "Despite lending you a hand so many times, isn't this comment too much?" "The only thing I asked you bunch was to help the 35th Test Platoon escape. If you try to win them over, I won't show you mercy." "I don't know about Hoshijiro-san, but the one I want to win over the most is you though?" "I have no intention of taking part in a terrorism-like dissent." As he refused bluntly, Kanata spat out a sigh. "... why are you so stubborn? Even you are trying to rebel against the Inquisition right now." "I'll do it in my own way. I have no intention of discarding Dullahan." "Even I don't have any intention of leaving it. But at this rate, your entire life will end as a puppet of Ootori Sougetsu. Because of that man, the world might be destroyed you know?" "What is the reason that makes you cling to being an Inquisitor? Does it have any relation to Ootori Ouka?" Kanata peeked into Hayato's face. He who hasn't shown any reaction until this moment, just looked towards her without moving. "——Don't play dumb. I'll crush you.Your conveying the message took too long. You probably have investigated Ootori Ouka already, haven't you." His speech became rough. Even when he delivered guidance with a hard fist to his subordinates for their poor performance, his tone of voice and look in the eyes were flat. And right now, that Hayato was full of anger. Even the Banshee's ace who experienced carnage and hell many times winced in response to his thirst for blood. If she lied any more than this, he would carry out what he said he would. If this man said he would crush someone, he would actually do it. "...about Ouka-san's parents, I haven't been able to find any clues no matter what date I looked through, but Hoshijiro-san learned something from a certain person and has an idea." "——Red Glare, the man who was once your boss. Although his term as a Dullahan was short he managed to climb up to the position of EXE's temporary captain, and after repeatedly rebelling against Inquisition he was forced to resign. A while after, he was killed by the remnants of "Red Butterfly's Insect Cage"..."
Unmoving, Hayato stared coldly at Kanata. She didn't mind it and continued. "In the Inquisition's database all the records about him were erased and all EXE members supporting him were fired along with him. Afterwards, they suffered a similar fate as he did. That's why there's only a few in the Inquisition who know anything." "It was hard to find someone who knows. Even those who knew kept their mouths tightly shut." Kanata took out documents from her bosom and held them out in front of Hayato's chest. Hayato didn't take it and just remained silent. "His real name was Mineshiro Kazuma. Although he had a wife and a daughter, he kept silent about his work. It isn't anything unusual. I'm the same too." "After leaving Inquisition he adopted a single child. The baby that was born without magic and survived the attack on the "Red Butterfly's Insect Cage"..."
She retracted the documents and looked in Hayato's face with a sigh. "It's been nearly nine years since it was rescued from Insect Cage but... that child was Ouka-san right?" In response to Kanata's speculation, Hayato silently closed his eyes. She took it as his affirmation. "Mineshiro-san has doubted Ootori Sougetsu and was sniffing around. That's why he caught attention of higher-ups... he was fired and killed. Am I wrong?" Hayato didn't answer. She couldn't read what is he hiding within. "Probably Mineshiro-san has had a grasp on something decisive. Ootori Sougetsu killed Mineshiro-san to hide it, and the only person who survived was Ouka-san who wasn't connected to him by blood." "From here on it's not Hoshijiro-san's but my own selfish guess... did Ootori Sougetsu leave young Ouka-san as to prevent you from betraying him? Was Captain told by Mineshiro-san anything like 'were something to happen I want you to protect my daughters'...?" In response to Kanata who stared at him seriously, Hayato glared at her coldly. And he started to leak out a heavy laughter. "Even if that was the case... what does it have to do with you." "I-it does. If these are the circumstances, for us dissidents Ouka-san would become a protection target——"
What could be seen in Hayato's wide-opened eyes was not irritation not anger. It was the sense of mission, the belief itself dwelled inside. "I haven't fallen to a point where I have to be protected by you dissidents, and I don't conform to Ootori Sougetsu in order to protect Mineshiro Kazuma's daughter. I'm not as soft as Red Glare as to suffer because of my own conduct." "...c-certainly Mineshiro-san wasn't a good talker but still, as a fellow Inquisitor you——"
"It's true that he taught me how to be a Dullahan. I'm grateful to him. It's probably true that Ootori Sougetsu adopted Ouka in order not to have me betray him. In fact, I'm trying to protect her. I cannot defy Ootori Sougetsu because of that. Your guess is correct." Hayato indifferently spoke of his own circumstances. "However, me protecting Ootori Ouka is no different from protecting civilians. There is no special fondness in it, it has nothing to do with Mineshiro. As an Inquisitor I just protect those that should be protected and eradicate those who should be eradicated." Pressured by his strong stare, Kanata gasped. "As an Inquisitor I cannot allow her to die, that's all. Do you understand, Oonogi?" "...you merely carry through with your duties as an Inquisitor and following the law... and none of your actions are dictated by emotions... is that what it means?" "I'm obeying my own laws. I have no intention of supporting illegal dissident organizations like yours. That's the wrong thing to do as an Inquisitor." Cloudless eyes is something that would perfectly describe his, Kanata thought. Unshakeable conviction. It was as if he was the Inquisitor's ideal sculptured in marble, surely, no matter how many people pushed him he wouldn't ever move. For him numbers didn't exist. For Zeroth Extermination Riot Police's captain, there was only the concept of "Dullahan". He was a living Inquisitor's ideal. He wasn't just, evil, all there was in him was the system called "Law". A human functioning only as a system... a broken one. She changed her thinking and her goal. It was impossible to draw Hayato in to the dissidents. He didn't allow Ootori Sougetsu's existence nor he tolerated the dissidents. Were she or Hoshijiro Nagaru commit a criminal act, Hayato would deliver legitimate punishment to them as an Inquisitor. Although she determined that it's not possible to make him an ally, his presence was too dangerous to have as an enemy. Somehow, she had to maintain their relationship to an extent of cooperation and matching interests. Even without Relic Eaters, this man was a dangerous existence. The moment Kanata decided, Hayato has suddenly opened his eyes wide looking at a distant dome-shaped official building. When she started to wonder what happened, ground under her feet started to shake. Certainly, it was shaking. The tremor has gradually increased and before long she has staggered. Hayato pulled out Relic Eaters from the holster and jumped down from the building. As Kanata tried to restrain Hayato, cracks ran through the dome-shaped building. The outer shell of the building which looked akin to a sports arena was filled with cracks and collapsed like an egg. The moment a chill ran down her spine, a loud screeching roar has reached her. The jarring cry resonated inside her belly and carved humanly instinctual fear into Kanata. "...Dragons...?! The things from 5th Laboratory were mass-produced...?!" Hearing Hayato's sober analysis, Kanata's face paled. The enemy introduced not only Einherjars, but also Mechanical Dragons. Kanata clenched her teeth and hesitated for a moment. The feeling of not wanting to die in this place and wanting to protect the Spriggans balanced each other out. The mission she was given by the dissidents led by Hoshijiro Nagaru was just solicitation of Kurogane Hayato and helping the 35th Test Platoon to escape. She would abandon those who can be abandoned. Her mission was the priority. However, if she abandoned her mission as an Inquisitor here, Hayato's muzzle might be aimed at her. Honestly——that was much more scary option. "I get it, I get it dammitt...!" Kanata clad herself in lead-colored Witch Hunter form's armor and took up the sniper rifle "Nobunaga". The enemies were three fake Dragons summoned with pseudo Myth Summoning. Despite the overwhelmingly disadvantageous situation, Kanata pulled Nobunaga's trigger feeling desperate. 10 kilometers from the company's camp, there was the subway which was their target. Currently, the 35th Test Platoon was entering the subway through an underground passage. By breaking through the grates and barricades, Ouka and the others proceeded through the lightless underground passage. By mounting night vision scope on the gun, Ouka looked into the ticket gate from behind a phone box. Although there was evidence of human activity, the essential thing, their figures couldn't be seen. When Ouka reported through radio, the Spriggans and Usagi together with them came up to her one after another while crouching. "It's strange... even lookouts are nowhere to be seen." Usagi stared with anxious expression, Ouka approached the tent that was stretched near the entrance. The coffee that was stood on top of the magic powered heater was still hot. As she looked around, she couldn't see any evidence of enemy running away in a hurry. It looked as if they'd suddenly disappeared. They were communicated that there's the same situation on other routes other squads took. Enemy hasn't fled, but the possibility that they were either evacuated further down or were hiding was high. "It's not up to me to decide... but, I can consult this a the very least." Ikaruga's guess was reasonable. Nothing good would have come from a plan that risks her comrades' lives. When Ouka tried to contact the commander, someone grasped her shoulder from behind. "Don't do unnecessary things. After we finish this operation our victory is pretty much determined right? There's no point stopping now." Kirigaya Kyouya shouldered Nero and glared at Ouka. Usually Kyouya acted on his own, but for some reason he decided to go together with 35th platoon. Ouka returned a glare at him. "Majority of our troops take part in this operation. If we're done in here, not only the camp but also the fifth line of defense will be assaulted." "Ha, if you're worried about comrades then even more the reason to hurry up and finish it. The soft ones are at their mental limit... if we don't decide it here, there's no later for us." There was some truth in there. With the status quo of having no supplies or reinforcements, the Inquisitors have survived from the beginning until the January's half. Everyone was exhausted because of sleeping in places where they have to be vigilant, and a number of people passed their mental limits. Moreover, the 7th company personnel decreased to 200 people. Since they came all the way here, it's better if they finish quickly and go back. "............fine. However, the ones who will be proceeding further is just me and you." "Who the hell are you saying this to... you want me to beat you up...?!" "Then prove it. I'll take the station's home, you take the walkway." "Don't order me around, I——"
"If you're scared then it's fine for you to remain here. I'll be fine checking the home and the walkway myself." Kyouya took away the bag containing C4 explosives from a Spriggan while clicking his tongue and began to walk towards the walkway. "...don't ya think he's a surprisingly easy-to-use man?" As Ouka shrugged her shoulders the bunch behind raised their hands, and Usagi spat out a breath to the side. While Ouka too has thought that he's simple, she also thought there's more than that to Kyouya. He had a violent temperament, but that was why it was easy to set him on the right trajectory. "I want others to ensure a retreat route through this place. If the two of us communicate that we'll be using a different route, or your own judgment tells you to, you are to run away without hesitation." As she told that to the Spriggans and Usagi. Usagi called out to her from behind as if to keep her in place. Ouka turned around only once. "It's all right, Saionji. 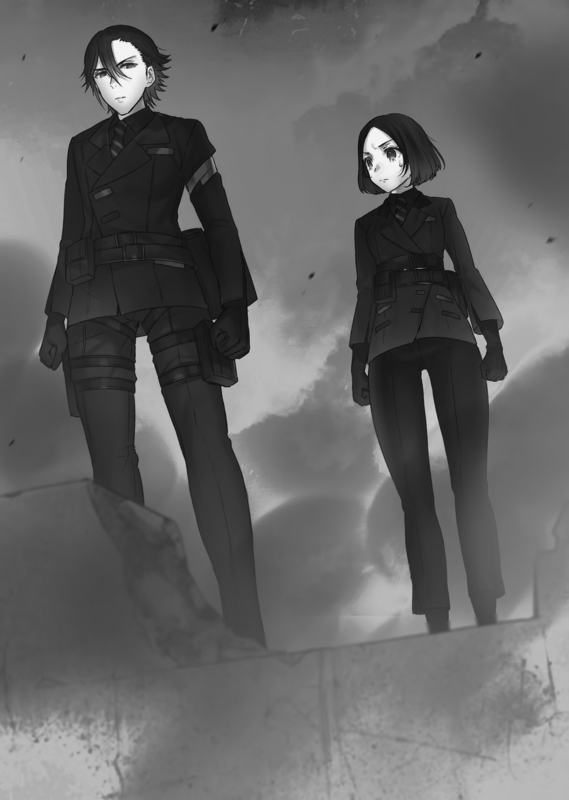 Until Kusanagi comes back, as the temporary captain I won't kick the bucket so easily. I'll definitely come back, don't worry." As she smiled gently, Usagi blushed and looked sideways. "...a-as long as you understand... it's fine? Since in a way you're our temporary captain... you dying would be t-troublesome." "Yeah. I know. There's no way I'll die and leave you behind." In response to Ouka who said so confidently, Usagi made a small nod, relieved. Ouka once again turned her back to others, and after passing the ticket gate she went down the stairs. The Spriggans and Usagi who were left behind thought that they should at least do what they can, and started to investigate. They examined the tents one by one and learned one thing. Anything they found were items usable by normal humans. Aluminum cups. Worn-out sleeping bags. Toothbrush with a paste on it. Guitar brought in for entertainment, calendar, harmonica. A worn-out gravure magazine, and a chess that substituted the pieces with empty medicine pills. A group photo with comrades. Family photo. A letter to a lover. Everything in there, proved that the ones they were killing are normal humans. "...I have seen something unpleasant." When Usagi's mental state turned into one that made her want to cry as she left the tent, she found the station's staff room. With the possibility of enemy being inside, she clung to the door's side with a PDW set up. She grabbed the doorknob with one hand, opening the door and immediately aimed the muzzle inside. After she entered the staff room, the spectacle inside turned her speechless. There were no enemies inside. To be precise, what used to be enemies was there. Lying next to the desk was a corpse of an old man wearing a military uniform of Pureblood Party. Usagi went down on one knee and checked the pistol lying beside the corpse. "He's probably the commander-class but... it was suicide, wasn't it." Feeling unable to stand it, she examined the room in detail. Although all the information was disposed off as expected, there was a brush and a pen placed on top of the desk. It could be seen at a glance that it was a suicide note. She didn't want to touch things left by someone who committed a suicide, but she thought that it might not reach its destination otherwise. Usagi took the letter in hand. It would be too sad if it was thrown into trash by someone without ever being read. The suicide note was something addressed to his daughter. "...Mimulus? That's a flower's name." In the language of flowers, it meant "show me a smile". Feeling sad, Usagi casually read the letter. To Mimulus Wallenstein. My beloved daughter. Although you might never read this letter, thinking of possibility of you surviving as you are, I leave this letter for you. Mimulus, it's been six years since I have been entrusted with you. You might not remember it, but I have met with you when you seemed to be fourteen years old. Even now I remember my dismay when I was told to keep an adolescent child. You disagree with West Side's on many matters, but I was delighted to see your quarrels with West Side. Even if we're not related by blood, as your father, your chest full of purity and pride is my own pride. I really think you grew up to be a honest person. I'm really... grateful to you. Love for his own daughter has been spelled on the suicide note. Even if they were unrelated by blood, he wrote just how much he loved his daughter. However, after Usagi finished reading the first piece, she noticed that there were following letters. There were three crumpled pieces of paper. Usagi took another one and turned it over. It's a lie. It's all deception. If it was me from the past, I would have told you everything directly. But now, it's impossible for me. I no longer know whether I love you or not. Why is it? The way you live should have changed, so why? In the end, was everything I have done for naught? Is the Mimulus I have brought up just one big lie? Did you laugh at me in the shade for trying to raise you pure as my own child? Laugh, my Mimulus. I loved you. My love for you was equal to that for my own son. But... you... I don't know. I no longer know you. The lines were drawn over the text, there were traces of him trying to erase it in a hurry. Usagi's expression tensed strongly. She couldn't tell what kind of content was it from the pieces that could be read, but it was bleeding insanity. I hate them. The Insect Cage that has hurt you, broke you, and turned you into a murderer. I hate the West Side that took my family as hostages and ordered me to release you. Oh, how scared am I of you, Mimulus. Your smile is so, so scary I can't help it. I don't want to look at my daughter being so dreadful any more. The smile that blooms on your face makes other feel respect, reverence. Your smile is like that of a saint and makes others immerse in peaceful feelings, they are unable to look away from your face...! Why do you laugh?! 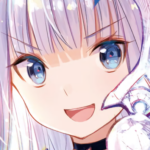 After having so many things done to you, how can you have such a pure smile on your face?! Laugh, Mimulus, what on earth are you?! What on nine hells did I raise?! The suicide note was like a scream. There was remorse, love for his daughter and fear. He himself was split inside, his mental state was out of order, he wrote the letter in such state. The sentences eventually turned into just a list of single words as the blood that has splattered all over it made it almost completely unreadable. Feeling madness coming from the strange wording, Usagi turned over to the last piece. On the bottom of last page, written with huge twisted characters there was. A suspicious name, seeing that name, Usagi was horrified. A chill, as if someone poured cold water on her has assaulted Usagi. Dropping the letter on the floor, Usagi stepped back and placed a hand on her mouth. "...I-I need to... tell Ootori...!" This place is dangerous. She needs to explain that to Spriggans, then take Ouka and escape from the subway. The moment Usagi bumped into the door with her back, she jumped outside. She grasped the doorknob and with a abandon closed the rusty door. In front of her, there was a smile. Ouka investigated the routes branching off from the station's home one after another. Unchangeably, none of them seemed to be populated. "There should be a number of people in here... there aren't many territories of Valhalla's left." While carefully checking, she went down the stairs to station's home. She was under the guise of calm, but her pulse wasn't calm at all. The rumor of Laugh Maker being here has clouded her mind. As Ikaruga pointed out sharply, Ouka stopped moving for a moment. "...so you can tell after all. I'm no match for you, Suginami." Nothing to be ashamed of. Told so, Ouka stared at the palm of her hand. The trembling of it could be easily misunderstood as convulsions. Ouka was aware that it didn't come from fear. She was trembling with excitement. She was delighted by the fact that the target of her revenge might be here. "...I have a feeling that says, she is here." "She is here... thinking that... I...!" "I'm feeling like doing something...!" Ouka realized she was laughing and covered her face with both of her hands. The joy she was unable to suppress has overflowed through a smile. At the thought of having her vengeance, she couldn't help but be glad. All the blood vessels in her body were boiling, her blood was simmering. "Ha-haha... I thought that... I'll be all right. The smile... I've had it the entire time since I came here. Trembling won't stop... are bodies really this honest? Even as I force it down, it overflows..."
"I didn't think I would turn this strange... or that I was this weak." She laughed mockingly at herself, and clasped her trembling hands together. As Ikaruga said so, Ouka stopped for a moment. She listened to the radio with a cramped smile on her face. Hearing Ikaruga's strong tone of voice, Ouka's expression turned back to normal. In the end, Ikaruga laughed lightly and said mischievously. It was a line that made Ouka imagine Ikaruga on the other side sit cross-legged and with a proud expression. Ouka spat out a deep breath and faced forward. That's right. I'm not alone. Comrades are with me. I can rely on them for more than just combat. That is why they're called 'comrades' aren't they. "...really, t-thank you. If I seem like I'm going out of control, it would be great if you stopped me." "I'm... really no good am I. I'm being saved by you guys the whole time." "Sorry. After everything's over, let me treat you to some food." Ikaruga's joke was suddenly interrupted, making Ouka feel puzzled. There was no reply. Not even noise has sounded from the radio, not a single thing. Thinking it's a malfunction, she took off the intercom and hit it with her fingers. The sound of her hitting it lightly has sounded in the darkness. Noticing a laughter mixed in with the sound, Ouka looked up. She raised her voice towards the darkness. Her voice echoed as if she was in the mountains and overlapped with the laughter. It wasn't a single person. There were many of them, there were many voices laughing. Squinting, she was able to see the source of those voices. On the track of the station's home, there, was a platoon of soldiers clad in red clothes. ......! There wasn't any presence at all in there before...! Ouka hurriedly activated Witch Hunter form and stood wary of enemy's movement. Enemy didn't move. Their heads drooped low while they stood upright and they wobbled to left and right. It was a bizarre sight. It looked like a troop of ghosts. The enemies held their wands. She was irritated by the situation that didn't make it clear whether she should shoot or not. Unable to understand what he said, Ouka frowned. Vlad spat a very deep breath inside of her head. At the same time as he spoke shortly, there was movement in the middle of enemy ranks. The enemy's laughter stopped, leaving only one person laughing. A charming, female voice. There was innocence of a young girl and eeriness that reminded Ouka of snake's tongue. Ouka could see a shadow coming in her direction while dividing the enemy ranks. Stepping on the gravel between the tracks, it slowly loomed towards her. 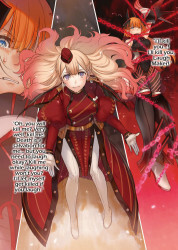 Distorted magic power surrounded its body like aura, and the person herself has appeared in front of Ouka. Bright red uniform symbolizing Pureblood Party. A little bit of blood was mixed in with her strawberry blonde hair. Clouded lifeless gray eyes. Red lips as if she sucked someone's blood drew a soft arc, making a smile of a saint. "Good evening. A wonderful night, isn't it." A gentle and soft voice. It a clear voice unfitting the battlefield. On the contrary, rustling resounded in Ouka's heart. "Nn...? That beautiful sunset-colored hair seems familiar. I know you." The giggling woman apparently knew about Ouka. "Certainly, it was during the work I have undertaken five years ago. That's right... I remember now! What am I saying here, there's no way I could forget about you!" "You were in the middle of that happy-looking family. Gentle father and mother, a little sister that you seemed to get along with. You're the one of them aren't you?" "That work, was really enjoyable. It was my last job as a member of Red Butterfly. I remember it even now. It was really nice." The woman stroked her red lips with her finger, tilted her head and smiled to Ouka. The only thing reflected in Ouka's eyes was the woman's figure. Vlad's voice and screams in the distance didn't reach her. Ouka knew her. There was no way her existence engraved in Ouka's memory could be forgotten. "When you killed your family——you had a wonderful smile." Once before, this woman said 'Laugh' to Ouka. With the same smile she had now, same voice whispering into her ear, in front of her——she robbed Ouka of everything. Laugh Maker. The one who has derailed Ouka's life, her abominable enemy was in front of her. Ouka launched from the train station's home and swung her right arm at the woman's smile. She used maximum output of 《Count's Fang》. She released a blow that boasted of a power which could possibly collapse the entire subway, not minding anything else. With a smile still on her face, Laugh Maker stroked her lips. That moment, the soldiers hanging down have aimed their wands at Ouka in unison and shot huge magic bullets. Ouka was unable to even think of avoiding it. All of the bullets struck her body and blew her away with an impact similar to that of a cannon. Her body was blown far, far away and crashed onto the wall. Enemy's magical bullets weren't something mere soldiers could create with concentration of their magic power. Each of them was comparable to a blow of an Einherjar. The lined-up soldiers have wobbled from left to right and all fainted. They sacrifices their lives and magic power simultaneously, and momentarily died. "Thank you for the treat.... you did your best. I definitely won't forget your smiles." With a benevolent smile, Laugh Maker spoke words of appreciation to the dead soldiers. All of the ones who died were smiling. There was no anguish in their expression, their eyes were wet with tears of regret, they died with huge smiles on their faces. The remaining soldiers were all smiling. They wailed and laughed at the same time. ——I don't want to die...I don't want to laugh any more...it hurts. Even though their voices were tragic and sad, they had big smiles on their faces. From under the collapsed wall, Ouka directed her sight at the woman. Ouka pierced through the cloud of dust and attacked Laugh Maker again. "What an amazingly straightforward child. Are you angry after all?" Laugh Maker stroked her lips again, and the soldiers summoned a magical circle, instead of magical bullets, they have released chains. The chains entangled Ouka's body and constrained her in the air. Bound with chains, Ouka struggled while glaring at Laugh Maker. She raised a distorted voice like a beast, seeing only her enemy she rampaged. Vlad's voice restraining her didn't reach, Ouka directed her murderous intent towards the Laugh Maker. "Why did you kill my family?! What did they have to do with you?! Answer me!" "My little sister was just five years old...! Five! Such a young child... you... and of all things you made me kill her...! I won't forgive you... I will never forgive yooouuu!!" Her fangs exposed, she forced her body forward. The chain tangled around her more and more as she moved. Their strength was incredible to the point where even Witch Hunter form's superhuman strength couldn't break through it. Laugh Maker jumped into the station's home and landed right in front of Ouka. She leaned forward right in front of Ouka, and stared into her eyes. It looked like a mad dog and its owner. "That Relic Eater... I remember it. Have you become... your own fathers, Red Glare's successor? Even if not connected by blood, he was your parent wasn't he." Hearing Laugh Maker's profound words, Ouka stopped moving for a moment while still in rage. "You came to take revenge for Red Glare haven't you?" "What are you talking about...! What does Red Glare have to do with me?!" "Oh? Can it be that you don't know? Just now, I've said that I have killed your family, but there was a good reason for that you know?" With a blank look, Laugh Maker said. "Your father, Mineshiro Kazuma wasn't a civilian. Called Red Glare once, he used to be the Inquisition's Witch Hunter and captain of the EXE. He has infiltrated my home 『Red Butterfly Insect Cage』 as it was on brink of destruction, and had caught me." Ouka was speechless as she heard the truth from Laugh Maker's mouth. She received a shock, learning that her adoptive father was Red Glare. But what surprised her even more, was the fact that her family was killed for such a reason. "So you massacred my family to take revenge for that...?! With just that as the reason?!" "Ahaha. No, that's wrong. I didn't really hate him. If anything, I was grateful to him. He was the hero who saved me. I don't kill anyone out of hatred." Laugh Maker wrapped Ouka's cheeks with both of her hands and stroked them gently. Looking at Ouka with benevolent gaze, she spoke the reason Ouka's family died. "I killed Red Glare because... he was in trouble." "He was given orders from Inquisition to devastate Insect Cage, and executed it. Several of the children that were supposed to be the goods were disposed off right? When he confronted me too... it looked difficult for him. I understood that his Inquisitor side and his gentle side were in conflict." With a tear moistening her cheek, Laugh Maker let out a deep sigh. "——That's why I saved him. I released him from his suffering. If one dies with a smile on their face, they go to heaven." Hearing a motive for murder she couldn't understand, Ouka boiled inside. What she understood, was only the fact that this woman was broken beyond help. Ouka glared at her with hatred, in response Laugh Maker made a wondering expression. "Why make such expression? You should understand as well. After all, you too should have become a Red Butterfly just like I did." "Don't speak... any more of that crap...! I'll kill you... right now...! "Ouka, listen properly okay? I'm not lying. Your real mother was the Insect Cage's merchandise like me. Because no magic power dwelled within you when you were born, you were supposed to be killed, but Red Glare struggled in order to save your mother. He wasn't able to save your mother because I killed her, but you have survived. Surely, he took you in to atone for being unable to save your mother. I'm sure that he caught me instead of killing for the same reason... that's right, to atone." Laugh Maker spoke the facts unknown to Ouka one after another. Ouka didn't know if what she said was the truth. However, there were many points that connected with Vlad said. If the witch Red Glare was trying to save was Ouka's mother, she could understand why would he take in Ouka who didn't even know her parents. ——However, so what if that was the case. That truth was no reason for her family to be killed. Her adoptive father, mother, little sister, her real mother, the truth that she killed them all didn't change. The number of reasons to hate her only increased. Laugh Maker spoke indifferently of the past, as if it was nothing. "It's okay... everyone died while laughing happily, right?" "Your little sister laughed too, right? Even though she was very sad to have her Onee-chan take her life, she did her best and smiled didn't she?" Ouka's anger burst out, she has pulled out her right arm from the chain all at once and hit Laugh Maker's face with her fist. Laugh Maker easily caught her fist with one hand. "What amazing strength! But my ancient property is quite something too." Laugh Maker's magical circle released a dazzling white light. Ouka recognized the property at a glance. Ancient Property "Radiance". It was a property that specialized in strengthening magic to the limit, and allowed to convert the target's life force into magic power. The magic bullet that hit Ouka before and the chains were released by the soldiers after they have passed their limits. "Hey... don't be so angry okay? No matter how difficult it is you have to smile. I have been trained in the Insect Cage to do so. You too should have become a Red Butterfly, so you need to follow my example." Stroking Ouka's cheek who was going wild, she made a sorrowful smile. "I was one of the Insect Cage's goods. I was hurt until I broke physically and mentally. Probably, I have tasted all the despair and disgrace, pain in this world. It was so hard I felt like dying, but then I noticed that if I laughed the trouble passed." "Even now, I'm grateful to the people of Insect Cage. After all, I'm always laughing, and I grant death while laughing to the people around the world. Don't you think it is a joyous thing?" "I'll kill you...! I'll kill you, Laugh Maker!" "Oh, you will kill me? Very well, kill me. Death is a salvation for me... but you need to laugh okay? Kill me while laughing won't you? I'll let myself get killed if you laugh." As Ouka lashed out with her eyes dyed bright red, Laugh Maker downcast her eyes sadly. "...you have decided already that I'm crazy haven't you. The people from Valhalla who took me in after I escaped from Inquisition were the same. They decided I'm abnormal, a monster, and have condemned me to loss of memory. Among them, even a person with shady love has appeared and tried to re-educate me you know? Why can't they understand I wonder..."
Although she hung her head for a moment, immediately after she looked up with a smile. "But it's all right! As long as we laugh anything will go well! To get you to know that, I need to grant smiles to more people!" Laugh Maker's eyes sparkled like that of a little girl as she said so triumphantly. Then, she created red butterfly wings behind her with magical power and put more strength into both of her hands that were wrapping Ouka's face. "Now, show me a smile? No matter how harsh the conditions are, you should laugh happily. It's all right, no need to be scared. Just like when you killed your little sister, it's fine to laugh and kill me." Having a premonition some kind of magic was about to be cast Ouka struggled, but she couldn't muster any strength from her body. For the completely-out-of-control Ouka it was impossible to build an operative procedure in her head. A magical circle rotated under Laugh Maker's feet and the butterfly wings fluttered. "Now——I will make your smile." Tears ran down the Laugh Maker's cheek as she activated the magic. There was no longer any way to escape. Just like back when she killed her family, she would be deprived of the control over her body and smile despite not wanting to. ——And just when Laugh Maker was activating magic. A mass of dark green magical power has hit Laugh Maker from the side. Her body bent to the side, and she was blown away. At the same time the chains were broken, Ouka's body has regained freedom. "Tch, there's not enough power...!" "Shut up, be silent you damn gun!" Kyouya left the ticket gate and went down the stairs, moving closer while holding a shotgun. Laugh Maker already flew away through the tunnel on her butterfly wings. After suddenly stopping in front of Ouka, Kyouya clicked his tongue with a chagrin. "It's your performance that's poor!" "Hmph, despite being an inorganic object you have a habit of making excuses...!" While severely cursing, Kyouya glared sideways at Ouka who knelt on the floor. "Ha, that's quite a way to show yourself after making a request to go alone, miss captain." "If you crawl on the ground right in front of your revenge, I won't be helping ya." Kyouya provoked Ouka while looking at her with scorn. "I'll kill her instead. You can sit there on your knees if you want." "——Shut up, I'll kill you." As a tremendous killing intent was directed towards him, goosebumps appeared on Kyouya's skin and he narrowed his eyes sharply. From behind her long bangs, he saw Ouka's eyes harboring a blue flame inside. Her eyes inside of the crimson-like hair and thirst of blood were remarkably strong, and the blue color shone. Looking at the mass of murderous intent her eyes have become, he let out a distorted laughter. "That's how it should be... ain't that quite a good expression, Ootori Ouka...!" "...I'll be the one to kill her. She's only mine prey." "Goin' all out aren't you. Let's have a match to see who can kill her first then, me or you." As Kyouya poised with Nero, Ouka stood up and activated Witch Hunter form again. The vengeful demons stood at the entrance to the tunnel. Both of them kicked off the ground and tried to run after Laugh Maker. ——By chance, Ouka's ears picked up a faint sound. After a moment of silence, she could hear some kind of noise. After looking at the suspicious source of the sound, she saw the intercom that has fallen to the ground after she was blown away. ——Ouka has finally regained sanity. With a pale expression she picked up the intercom and attached it to her ear. Speechless, she looked towards the stairs leading to the ticket gate, she saw something like a dark red mist silently come down. Hearing Usagi cough violently, blood was drained from her body and she paled. She finally realized that she forgot herself in revenge and neglected communication with her comrades. 'Tch, she used such a dirty trick... hey, we need to hur——"
Before Kyouya could even finish, Ouka kicked off the ground and started to sprint. The destination she headed to wasn't where Laugh Maker was, but the one her comrades were in. Seeing Ouka desperate, even if Kyouya didn't understand what's happening he still followed after her. When she arrived at the entrance, it was already filled with poisonous gas. She found Usagi immediately, she tried to carry two Spriggans who couldn't move. There were corpses of Pureblood Party all around as well as corpses of many Spriggans. The enemies Laugh Maker manipulated were also hit by the poisonous gas. "I-I'm sorry... geho... I was wearing the mask but... it was also corrosive..."
Ouka was unable to let out any voice seeing Usagi. Wherever skin could be seen there was something like black bruises. Mask also was corroded and had a hole in it. Fortunately Usagi's mask barely withstood it as it was specially made by Ikaruga, but masks of the Spriggans have completely collapsed. "...hurry... you need to get out!" "The Spriggans... we can't leave them... at least those two..."
Pushing her away by the shoulder Kyouya moved to the front. He squatted down in front of the Spriggans and Usagi, placed a hand on their foreheads and expanded a dark green magical circle on their foreheads. "Since Nero's property is "Poison", it can generate enough to neutralize other." The black bruises disappeared from Usagi's and the Spriggans' bodies. After neutralizing the poison, Kyouya carried one of the Spriggans on his shoulder and dragged the other by his collar. "It's too late for others. Hurry up and carry Saionji. We're escaping." "Kirigaya... nhh, I owe you." 'Shut up. Dammit, you've completely lost the edge." She did as Kyouya said as he turned away irritated, Ouka lifted Usagi in both of her hands. "Ootori... I'm glad...you're safe... I couldn't contact you... and was worried..."
"...? Why are you crying...?" While holding Usagi who was mystified, Ouka shed tears. She knew that she had no right to apologize nor any right to cry, Ouka was overwhelmed by her own weakness. All the words she spoke to her comrades and Vlad ended up being a lie. Ouka earnestly blamed herself for being manipulated by her own revenge. However, if she abandoned her mission as an Inquisitor99 here, Hayato's muzzle might be aimed at her. I believe there's an 99 extra here. "The lines were drawn over the text, there were traces of him trying to erase it in a hurry." "Because of that man, world might be destroyed you know?" (the world) It seems like there is still something that yours truly can notice what others haven't :P Thanks for the dose of darkness Krytyk. Umm... in German, 'W's are pronounced like 'V's in english. It's Wallenstein (like Aiz in DanMachi). So Laugh Maker is basically the Joker? "Why so serious? Let's put a smile on that face." joker is more crazy for he expresses more emotions than just sadness and craziness. the jker goes beyond just being crazy if read some of the reall dark comics about him. ..., the old man was unable to bear it no longer and covered his face. -> I think this is a double negation, right? Forgive your weak father, Mimulus... this is the last time you will used." Forgive your weak father, Mimulus... this is the last time you will be used." The fact that current her was a lie. The fact that the current her was a lie. "What will do if you know." ..., she bears name of Ootori and cannot be trusted. ..., she bears the name of Ootori and cannot be trusted. Despite overwhelmingly disadvantageous situation, Kanata pulled Nobunaga's trigger feeling desperate. Despite the overwhelmingly disadvantageous situation, Kanata pulled Nobunaga's trigger feeling desperate. ..., the Inquisitors have survived since the beginning until the January's half. ..., the Inquisitors have survived from the beginning until the January's half. The Spriggans and Usagi who left behind thought that they should at least do what they can, and started to investigate. Although the any informations were disposed off after all, there was a brush and a pen placed on top of the desk. A little of blood was mixed in with her strawberry blonde hair. She used maximum output of 《Count's Fang》Vampire. -> seems like the brackets are not set right. After all, you too should have become same Red Butterfly I am." After all, you too should have become the same Red Butterfly as I am." At the same time the chains were broken, and Ouka's body has regained freedom. The man who cold be called 'old', asked her. The man who could be called 'old', asked her. "Yes. We need to retreat as soon as possible, give them treatment and allow to rest. "Yes. We need to retreat as soon as possible, give them treatment and allow them to rest. you forgot to close the code..
"Now——I will make you smile." "...I'll be the one to kill her. She's mine ." "...I'll be the one to kill her. She's my/mine prey." Thanks, though half of them aren't wrong. From the top: 2nd fix - no need for 2x 'them'. It's not incorrect. Make your smile = not wrong, it means exactly what it says, she said she is going to make her smile, as in create the smile itself. She didn't say she's going to make HER smile. The last one... well, it sounds awkward but it sounded awkward in Japanese. There was really strong emphasis on "mine" or rather "only mine". .....the author has "maiden in distress" fetish...? oh wait, why am I so surprised. lol. Wooow that letter was so terrifying I was looking around me every second in fear. ohh nice, but it felt a bit too short. Eagerly awaiting the ext release. Holy crap! I had shivers this entire chapter! Laugh Maker is so freaking scary! The antagonists in this series are all awesome. But one thing i am understanding after reading this volume is the importance of kyouya to the 35th platoon. Because of some earlier foreshadowing, I believe Kusinagi well eventually end up using the homonculus and soul detach charm for Kyouya's childhood friend Akira.